Bring a touch of Gothic charm to your table settings this Halloween. 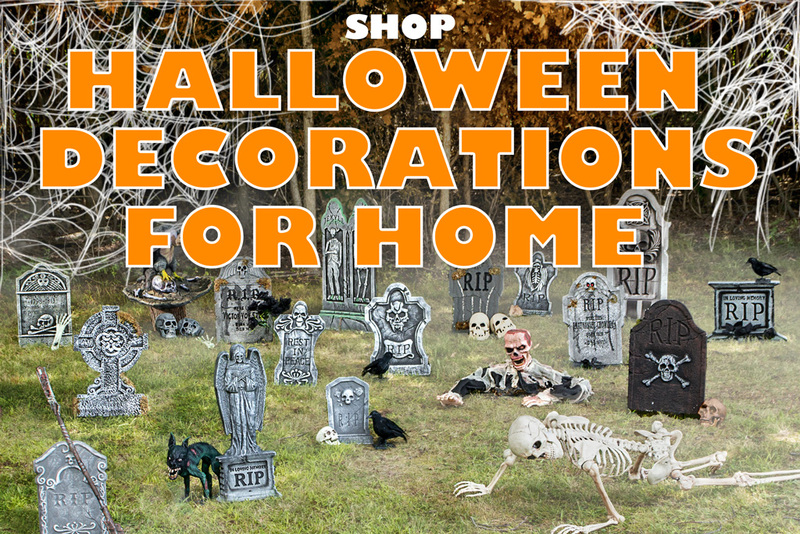 Follow the steps of this tutorial and you’ll have decorations that even the most ancient vampire would cherish for eternity. The chalkboard paint is not only functional, the matte black finish lends a creepy feel to the finished bottles. This project requires drying time between steps so make sure to make your DIY table setting a few days prior to your event. Step 1. This step requires a long drying time. Start by cleaning your bottle well inside and out. For this project you can leave the labels on the bottle, they can be used as part of the final design. 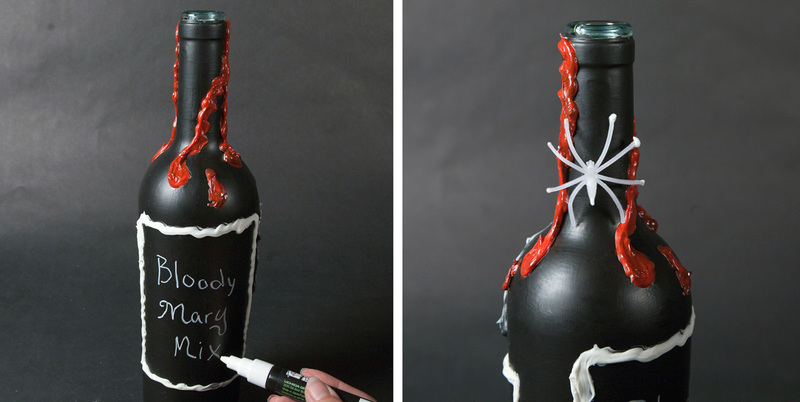 To make a spiderweb on the bottle, use the clear silicone to draw a curved line on the neck of the bottle. The silicone will start white, but dries clear. Even if your application is a little rough, it will still look really cool when the project is complete. Step 2. Draw a curved line in the opposite direction, as shown. Step 3. Add 2 evenly spaced lines. Step 4. Connect the lines together, as shown to start resembling a web. Step 5. Continue connecting the lines to finish out the web pattern. Step 6. If you have room, you can make one side of the web hang down a little lower. Step 7. Let the piece dry for several hours until the silicone starts to turn clear. Step 8. 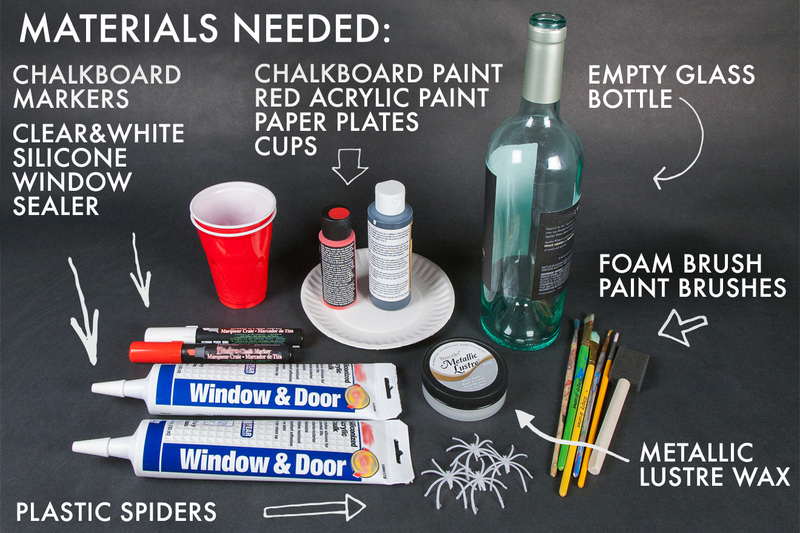 Using the foam brush, apply a coat of chalkboard paint to the whole bottle in long vertical strokes. Allow the paint to dry approximately 1 hour. Step 9. Apply a second coat of chalkboard paint in horizontal strokes. Allow the paint to dry to the touch, about 30-60 min. Step 10. 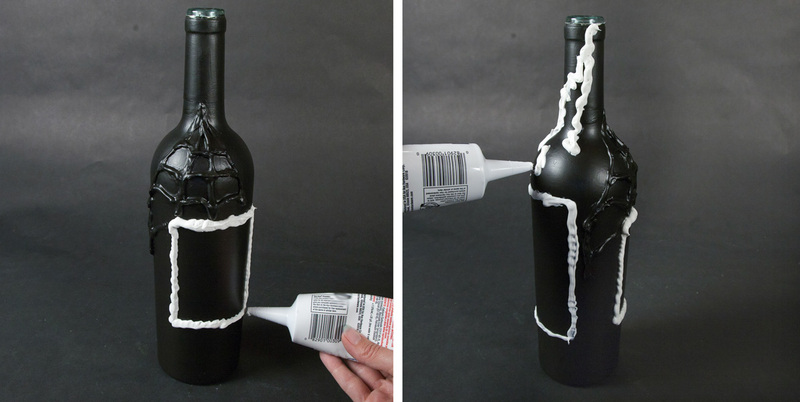 Use the white silicone to outline the bottle labels. Step 11. Apply the white silicone to the neck of the bottle to resemble blood pouring and dripping from the bottle. Step 14. Allow the silicone to dry to the touch. This could take several hours. Step 15. Once the bottle and silicone are dry, use a soft rag to apply the metallic lustre wax to the spiderweb. This is a really cool technique. The web looks like it’s part of the bottle, and the metallic lustre wax highlights the web nicely. Step 16. Paint the blood drips, you can mix the red acrylic paint with a little of the black chalkboard paint to give the blood a darker look. 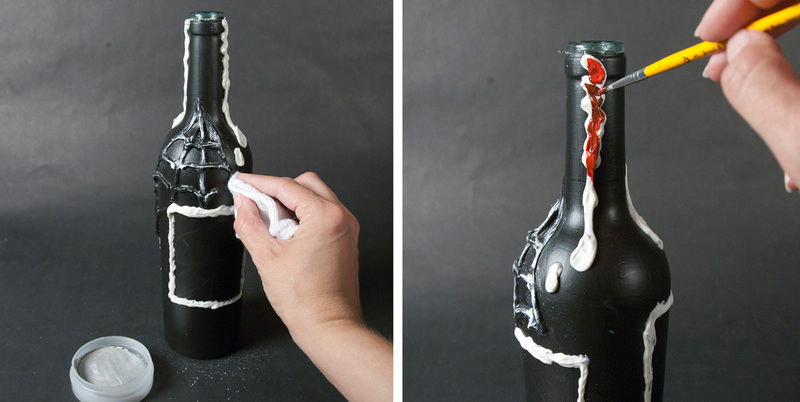 I left the silicone around the bottle label white, but you can paint it as well. Step 17. 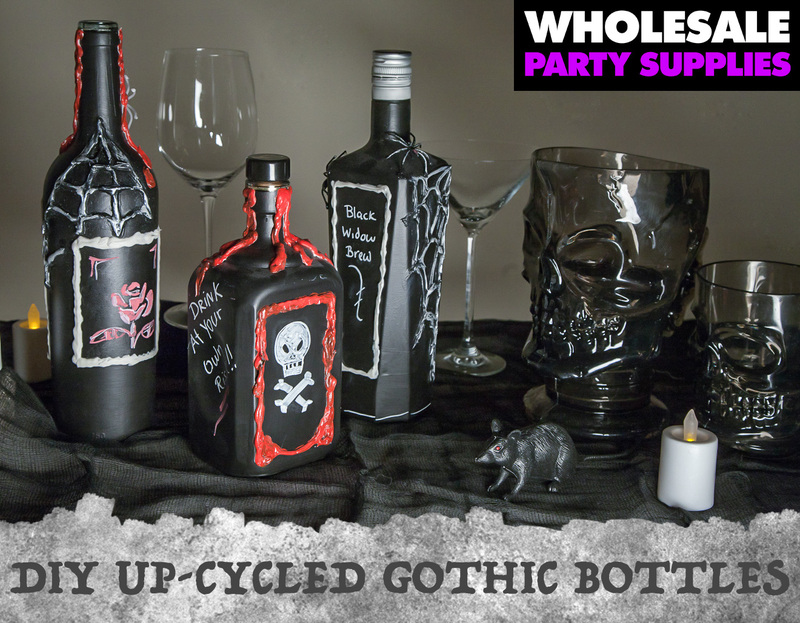 Use the chalkboard markers to decorate your bottle and label with the name of whatever ghastly drink you plan on serving. Step 18. Use the clear silicone to attach spiders to your bottle. I used white spiders, If you use black spiders, you can rub them with the metallic lustre wax to create a metallic effect. Your bottle is finished! The bottle will look even better as part of a group. Mix up your designs to add a variety to your collection. 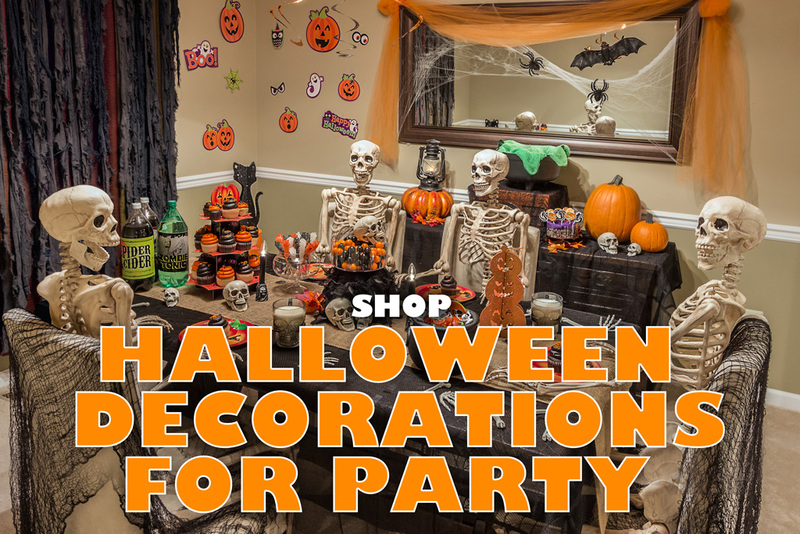 If you are still looking to round out your dark, unearthly Halloween decor, browse our store for more shadowy props and decorations. Here are the steps in one simple guide for you Halloween Pinterest boards.